Aberdeen Anarchy is WrestleZone's WrestleMania with special guests, star attractions and presenting an overall experience as opposed to just a wrestling show. For the last two years it has been an event that is a highlight of my wrestling calender and this year will be no different. 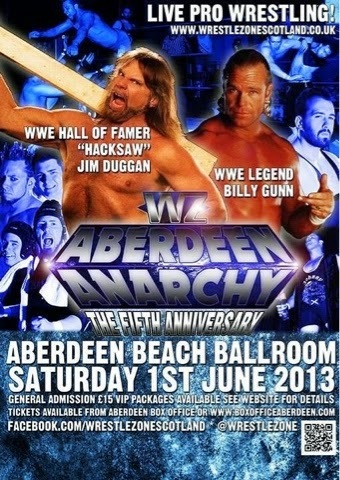 Back on June 1st 2013, I attended Aberdeen Anarchy, the fifth event but the first to take place in the Beach Ballroom. This was a venue that had seen wrestling in the past but not for 30 plus years. WrestleZone were pulling out all the stops by bringing in an 80's Legend and an American Icon in "Hacksaw" Jim Duggan. If that wasn't enough nostalgia, they also announced that Billy Gunn would also be at the event which sprung a generation that grew up on the Attitude Era into life. Two guests that peaks the interest of two generations. I went because it was Billy Gunn attending, I mean, this guy was one of "my boys" and the chance to meet him? Oh hell yeah! But it wasn't the guests that kept me coming back, the first match I saw on the main Aberdeen Anarchy show was Stevie Xavier vs Bingo Ballance. If there is ever a match to draw you into an event this was it. The high-flying, the crispness in movement, it was a masterpiece. Quite possibly the best opening match that I've ever seen. From that point onwards I was in for a ride of nostalgia and cementing why I love the crazy world of professional wrestling. The venue was beautiful, the wrestling was incredible and I was only a short train ride from my own bed. Was this heaven? That night I was among the 1,103 in attendance for a record breaking night in Aberdeen. A night that lives in my memory for evermore. What could top that? May 10th 2014. Aberdeen Anarchy. Oh man. I have never been so excited for an event like I was for Aberdeen Anarchy 2014. Scotty 2 Hotty was coming to Aberdeen and this guy was my hero growing up. It was like Jeff Hardy, Stone Cold Steve Austin, Scotty 2 Hotty. I would try and do the worm but could never manage it. WrestleZone had outdone themselves again, I attended their Regal Rumble event to witness Jack Jester win the main event battle royal and saw the intense brawl between him and the Champion, Crusher Craib. I had seen Grado book his place at Aberdeen Anarchy by defeating Jay Lethal and Zach Dynamite to go onto face Scotty 2 Hotty at the big show. Yes, Scotty 2 Hotty vs Grado. The Worm vs The Slug. This was the must see event of the year, Aberdeen Anarchy 2015. WrestleZone returned to the Beach Ballroom and opened up space in the balcony so that more people to come in, 1,271 rabid fans flocked to Aberdeen to see WrestleZone put on their finest show ever. This event showcased what WrestleZone offers in terms of family entertainment from a wrestling match between Andy Wild and Bingo Ballance, a heated contest between Aspen Faith and Len Ironside. It featured comedy from Alan Sterling and the amazing Grado vs Scotty 2 Hotty match. It had a brutal ladder match between Thunder Buddies and The Hotshots. Plus X-Pac in action in a six man tag team match and an expertly built main event between Crusher Craib and Jack Jester. 1,271 people didn't just see a wrestling show, they saw the best wrestling show in the North East of Scotland that I have ever seen. It'll be a night of shock, awe and action. The landscape of WrestleZone will never be the same. You won’t want to miss this! The VIP Meet and Greet tickets have sold out but there will still be a chance to meet the special guests.